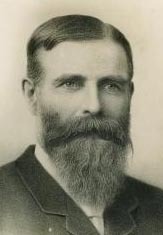 James Henry Greathead was a real person and in charge of the Tower Subway dig making him the perfect person to join the Doctor in this adventure. You can read all about him at his wikipedia entry. This story required a number of specially made figures, including our stand in companion, James Greathead. He started life as a Professor Yana figure now with added beard and moustache. I also required a figure for the tunnel worker and turned to one of my red painted Lazlos (previously used in the 4th Doctor story The Space Mutant), lopping off the piggy ears and nose and replacing his face. Unfortunately the new nose looks just as piggy as before. A flat cap completes the look. The tunnel workers have been doubled in number by the inclusion of the 4th Doctor's custom companion Wun Tun, though you only get to see his body. You will spot another custom Victorian figure in the street scene but he's been made for a future story. I made full use of any vaguely Victorian looking figures, hence the Gelth Zombie appears as a body and the arguing couple utilise Idris and the regenerated Master albeit shown in silhouette to disguise their identities. 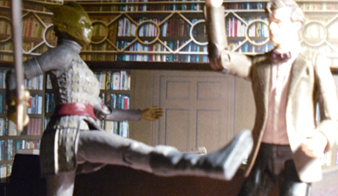 In the absence of an official Vastra figure, I have used a regular Silurian warrior. Not really a problem since they were all played by the same actress and therefore look identical, plus at this time of her life, Vastra would not be wearing her Victorian garb. 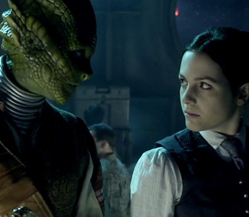 Obviously this story was inspired by Madam Vastra, the Victorian sword swinging lesbian lizard from A Good Man Goes To War, a terrific creation and one that I hope we see again. Us Who fans love to fill in the continuity gaps and backstories and A Good Man Goes To War is full of them- when and how did the Doctor meet Vastra or Strax? I was originally going to have an earlier Doctor meet Vastra. This story might have suited the seventh Doctor but I decided to keep it within the Matt Smith era. Excuse me, are you the Doctor of archaeology? Then you’re expecting these things from the dig. Dig? In London? Tube Trains? 1870. Excllent, then you must be James Henry Greathead. Wonderful to meet you. Now what have you discovered? Those are reptile bones aren’t they? Mr Greathead, you may have found parts of a dinosaur. Confound it, that Darwin chap was right. What do you think Doctor? Were we all descended from apes and reptiles? From apes definitely. From reptiles, I’m not sure. I think they took a different path. This is a queer piece of paraphernalia. Doesn’t belong with these bones but the tunnel men swear they unearthed it yesterday. Mr Greathead, get your men to stop digging. Now! Clayton Hickman's Brilliant Book 2012 is a great read and a wonderful companion to the series. I definitely recommend picking it up. But there are a few of his choices for Vastra's backstory that I disagree with. Clay's version says Vastra is "newly hatched" when the Metropolitan tunnel is dug (about 1861) and seems to suggest she lives in the tunnels for sometime before the Doctor arrives on the scene. But the fact that the Doctor prevents her attacking tunnel workers suggests that it happens almost as soon as she wakes. Plus a fully grown Vastra already has a strong bond with the sisters she loses in the accident. One piece of Clay's story that I do love is having Vastra in a Victorian freak show, an early idea I considered for my story. The script was completed on 3 August 2011 taking the few clues from A Good Man Goes To War for it's basic plot. The Doctor also tells Vastra how the Time Lords got their abilities, via exposure to the time vortex. I've purposely avoided that conversation here on the assumption that the Doctor and Vastra have more than one meeting. Something that Clayton Hickman's Brilliant Book supports. Other things that I've deliberately ignored are how Vastra meets Jenny and how she becomes a Victorian adventuress though it's suggested in the final frames. It's unlikely we'll see figures of Vastra and Jenny (unless they return to the series) but if we do, I'll certainly be happy to see them in action on the AFT. There's plenty of mileage to get out of them. I seem have to been a bit confused in my research for this story between the Thames Tunnel (later to become the East London Line, now The London Overground, excavated in the 1840s) and the Tower Subway built by Greathead in 1869. I should have just waited for the Brilliant Book and set it on the dig for the Metropolitan Line in north London instead. The Tower Subway was a short-lived river crossing superseded by Tower Bridge. For the confrontation between the Doctor and Vastra I wanted a London landmark and having decided on the location of the dig, I considered Tower Bridge (thought not built at the time) or Big Ben. 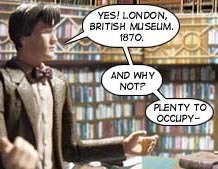 However, realising that books could be a common ground for the Doctor and Vastra to bond over, I moved the confrontation to the British Library (now located near King's Cross) and discovered that at the time of my story, it was housed at what is now The British Museum near Holborn. Shooting began on 25th September 2011 with the damaged Silurian base. The following day the base was spruced up to become the same location, millions of years in the pas as well as the setting for Vastra's reading book, The Madam Ikdell Mysteries. 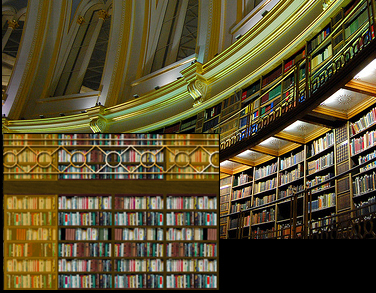 On the 28th September, I filmed the scenes in the British Library. 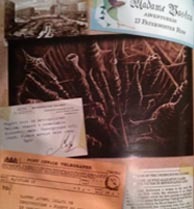 The sets for this have been recreated from images of the actual location. Filming then paused until 3 November when I did the various chromakey elements, such as the rooftop chase and completed on 4 November with the London street scenes. Hang on, wasn't this story set in 1870 last time? Yes, your eyes aren't deceiving you. My own notes for the story set it in 1869 but for some reason in the script it became 1870 and had to be subsequently ammended. Some of the dialogue at the end was changed. The Doctor mentions that James, as a South African knows what it's like to be an outsider and will take Vastra under his wing. 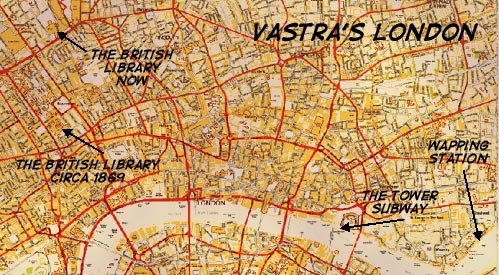 Vastra was to be given use of James' London house. However, I felt that the character of Madam Vastra would probably have made her own way without the assistance of a human. The "Grand Old Man" that the Doctor refers to is Prime Minster of the time William Gladstone. 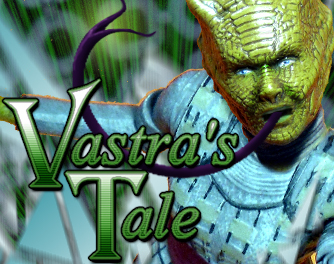 Part One of Vastra's Tale was posted on 23 November 2011 as part of the AFT's Tenth Anniversary celebrations. Part Two was due on 23 December but editing wasn't finished (largely because I was too busy doing panto!) until 3 January 2012. It was posted on 9th Jan 2012. As mentioned above, the story takes elements from A Good Man Goes To War. Madam Vastra in that story comes from 1888. This run of 11th Doctor stories are set in series 5, after Cold Blood. In the last story, the Doctor and Amy receive a summons from River Song. Amy has gone to answer the call at the end of the universe. We'll catch up with her next time.